This Man Protects His Mistress from Being Brutally Beaten Up by His Wife and Daughter! Growing up, our parents made us believe that they will stick with each other until eternity. But what if you suddenly caught your father cheating on your mom? What would you do? 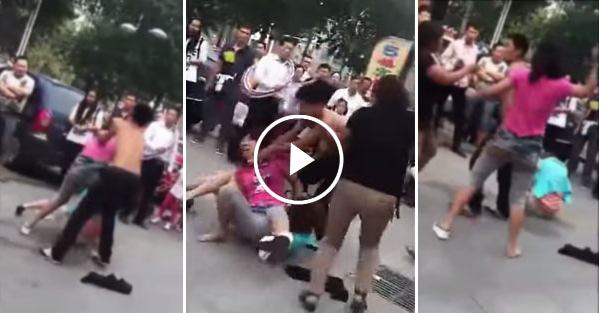 In this video, you can see a man and a woman being beaten up by another two ladies. It turns out that the two ladies were the wife and the daughter of the man and the other woman is the mistress. The wife and the daughter continually beat up the mistress and the father. Take note, they did this in a public place! Despite the fact that the wife and the daughter is already attacking him, he still managed to protect his mistress. He even tried to carry his mistress to a safer place, but he failed because his wife suddenly attacked him again. As soon as this video reached the online surface, the netizens also posted their opinions. Some say that the mistress deserves it while others claim that scenes like this should be done privately!